Every device connected to the internet has what is called an IP address, or Internet Protocol address. There are public and private IP addresses. The IP address 192.168.0.1 is a private IP address and is the default for certain home broadband routers, principally various D-Link and Netgear models. Your computer has a public IP address assigned to you by your Internet Service Provider (ISP), which must be unique across the entire internet. Your router has a private IP address, allowed only on private networks. This IP need not be globally unique, since it is not a direct access address, i.e. no one could access the IP address 192.168.0.1 outside of a private network. The Internet Assigned Numbers Authority (IANA) is the global organization that manages IP addresses. It initially defined a type of IP address called IP version 4 (IPv4). This type is a 32-bit number usually expressed as four numbers separated by a decimal point — for example, 192.168.0.1. Each decimal must have a value between 0 and 255, which means that the IPv4 system can accommodate about 4 billion unique addresses. This seemed like plenty in the early days of the internet. . . but more on that later. These private IPs total about 17.9 million different addresses, all reserved for use on private networks. This is why a router's private IP does not need to be unique. The router then assigns a private IP address to each device in its network, whether it's a small home network or an enterprise-level organization. Each device inside the network can connect to another device in the network using this private IP. Private IP addresses cannot, however, access the internet on their own. They need to connect via an internet service provider (ISP) — for example, Comcast, AT&T or Time Warner Cable. In this way, all devices actually connect to the internet indirectly, first connecting to a network (that is connected to the internet), and then connecting to the larger internet itself. Public IP addresses must be globally unique. This posed a problem for the IPv4 standard, since it can accommodate only 4 billion addresses. Hence, the IANA introduced the IPv6 standard, which supports many more combinations. Instead of using a binary system, it uses a hexadecimal system. An IPv6 address is therefore composed of eight separate groups of hexadecimal numbers, each comprised of four digits. For example: abcd:9876:4fr0:d5eb:35da:21e9:b7b4:65o5. Obviously, this system can accommodate almost infinite growth in IP addresses, up to 340 undecillion (a number with 36 zeros). There are multiple ways to find your IP address. 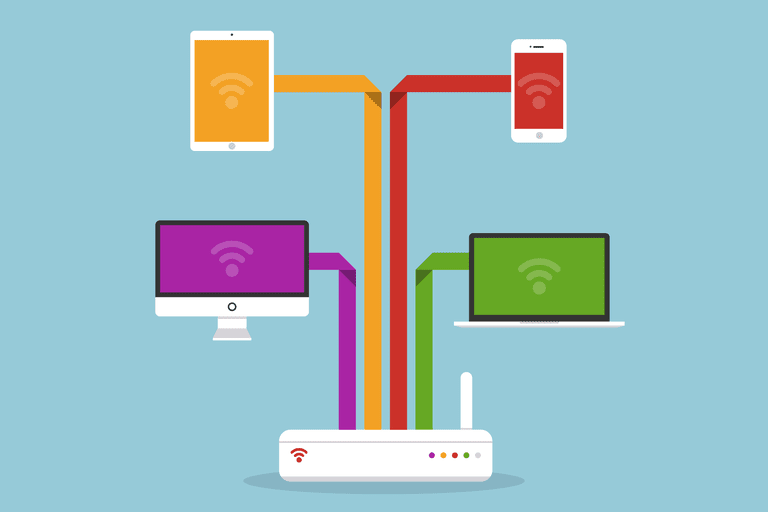 If a computer (or any other connected device) is operating on a private network that connects to the internet (like those in most homes), each device will have both a private IP assigned by the router and a public IP address. You rarely need to know your public address, unless you are troubleshooting your computer remotely and need to connect to it. The easiest way to locate your public IP address is to navigate to google.com and enter "my IP" in the search box. Google returns your public IP address. Of course, there are many other ways, including websites specifically dedicated to returning your IP, such as whatsmyip.org or whatIsMyAddress.com. Click the Windows menu, then select Command Prompt. Alternatively, you can use the keyboard shortcut Windows Key + X to open the Power User's Menu. Type in ipconfig to display a list of all your computer's connections. Your Private IP address (assuming you are on a network) is identified as the IPv4 Address. This is the address at which you can be contacted by anyone in your own network. Your router's IP address is set by the manufacturer at the factory, but you can change it at any time using the network router's administrative console. For example, if another device on your network has the same IP address, you could experience an address conflict so you would want to ensure that you have no duplicates. Any brand of router, or any computer on a local network for that matter, can be set to use this address or a comparable private IPv4 address. As with any IP address, only one device on the network should use 192.168.0.1 to avoid address conflicts. My Router Says Its IP Address Is 192.168.1.254. What Does This Mean?